Q: ​​​​​​​​​What does the word ‘giraffe’ mean? A: ​​​​​Swift. When giraffes gallop away, they might look like they are slowly trotting, but they are actually fast runners. 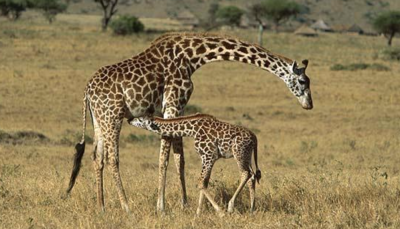 The scientific name for giraffes is “Giraffa camelopardalis”. We have adopted the word ‘giraffe’ from the Arabic word ‘zirafa’, which translates as swift or fast. You might wonder how an African animal got an Arabic name because they do not live on the Arabian Peninsula. Before Christopher Columbus arrived on land in the Western Hemisphere, Arabs had established outposts in Africa in areas where giraffes lived in order to conduct a slave trade of Africans. We sometimes give local names to animals and in this case, we have adopted a name that describes the creature’s behavior. Giraffes run so fast that if a giraffe were racing the fastest human being on the planet, Usain Bolt, in a 100 meter run, he would be charging past the 80 meter mark or so when the giraffe crossed the finish line. The ‘camelopardalis’ part is borrowed from an ancient description of the physical appearance of the animal. The first part is because the long neck resembles that of a camel, while the second part is because the coat pattern resembles that of a leopard. The word combination is a little peculiar because camels and leopards only co-exist in a narrow band across the African continent, from the tip of Ethiopia to the West African countries of Senegal and Guinea, in the region where the Sahara Desert slowly changes into a savanna woodland habitat. Q: ​​How long do giraffes live? A: ​​​Less than 30 years. About half of the giraffes born do not survive their first year of life, but, of the ones that do, most of them only live for about 16 years. The biggest cause of death among giraffes is predation by lions. The lions not only feed upon new babies, and young giraffes, but they can pull down a fully grown adult male. A baby giraffe stands about six feet tall, and might weigh up to 200 pounds, but an adult male lion weighs twice as much. 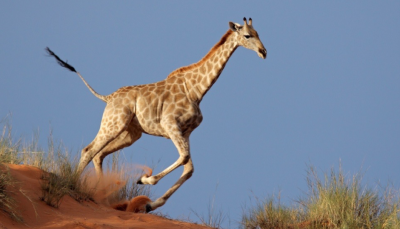 Although adult giraffes can run quickly, baby giraffes are not that adept at running, and a charging lion can outrun a galloping adult male giraffe over a short distance. In the same way that most people do not live to be 100 years old, most giraffes do not live to be 30 years old. To know how long a giraffe lives, you need to know when the giraffe was born, and hardly any information exists from the wild about the actual lifespan of giraffes. In the most detailed study available, the oldest male lived to be close to 22 years old, while the oldest female was about 28 years old. Giraffe are like people, and most animals where males are larger than females, in that females often have a longer life then males. Girl power exists in life expectancy. Q: W​hat do giraffes eat? A: ​​​Mostly leaves. But they are picky about which leaves they eat and usually wander from tree-to-tree every few minutes. Not all leaves are the same. Even the leaves from one tree have a different taste because of the smoothness or roughness of their surface and the chemicals inside the leaf. Just like bananas; they don’t all look or taste the same. It depends upon how ripe they are, and leaves ripen at a different rate depending on where they are found on a tree. 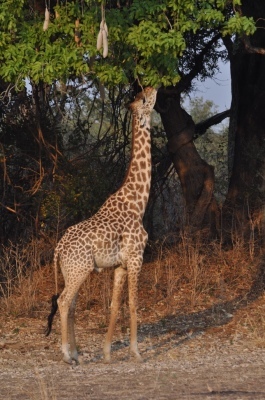 Giraffes eat the leaves from over 100 types of plants, so the giraffes in northern Africa often eat different leaves than those in southern Africa. One of their favorite foods is the acacia tree. They not only eat the leaves, but also the flowers and seeds from acacia trees. But they also like eating leaves from a lot of other trees, like the sausage tree, a type of plant that got its name because the fruits look like 25 pound sausages. You don’t to be standing under a sausage tree when the fruit falls down because it can crack your head open! Giraffes are like koalas because they get most of the moisture that they need from eating leaves. Neither koalas not giraffe have to drink every day, but they do need water to survive. Q: How many kinds of giraffes are there? A: ​​Scientists do not know. Most biologists think that there are nine types of giraffes, called ‘subspecies’, but other biologists disagree. Every Dalmation dog, even those in the animated feature “101 Dalmatians”, has a unique coat pattern, as individual as a human fingerprint, and every giraffe has a unique coat pattern. The coat patterns differ among the giraffes living in different parts of Africa. Some are shaped like snowflakes and some are shaped like rectangles. Giraffes have been divided into nine types, or groups, partly based upon these differences. So, there are nine patterns, but they are not always that distinct. In the same way that black and white are different, there are many shades of color connecting black to white, so the two ends are different, but a continuous color change can be followed from black to white, or from one giraffe type to another. In this case, the different types are like breeds of animals, so they are called ‘subspecies’ or ‘species’. However, just like people, other than twins, every giraffe also has a unique genetic profile. And, as with the coat pattern, the genetic pattern of giraffes is a continuous change over the African continent, so dividing them into groups is difficult. Using the genetic information, scientists have concluded that there might be four species. Finally, combining all of the information, and trying to sort it out has led scientists to conclude that there might be two or six or eight kinds of giraffes. And that is why we do not know how many kinds of giraffes there are. It all depends upon what information you look at and how you divide a slow changing pattern into separate categories. A: Africa is home to a little under 100,000 giraffes. Sadly, the number of giraffes has been plunging for decades. In the 1980s, probably 150,000 or more were roaming the countries of Africa. As a result of the rapid decline in numbers, giraffes are now considered in danger of extinction. They have been classified as “Vulnerable” by the International Union for the Conservation of Nature, which puts them into the same category as African elephants, lions, Pacific bluefin tuna, sperm whales, and woodland caribou. In some areas, giraffes are killed in order to make fly swatters from their tails. In other places, giraffes are sometimes caught in snares set for other animals, and then die a very slow and painful death either from strangulation or an infected wound. Some giraffes live in areas where terrorists and illegal militia roam, and they kill them for food. In many areas in Africa, giraffes are simply running out of room to roam because their landscape and habitat are being gobbled up, or ruined, by people. 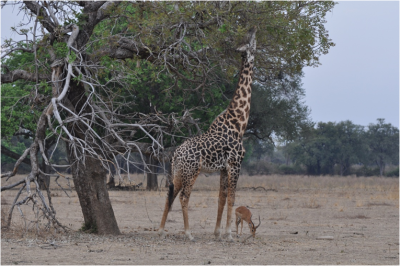 Because a giraffe female has a baby only about every two years, and because about half of giraffe babies are killed by lions within their first year of life, it is difficult for giraffe populations to increase in size. 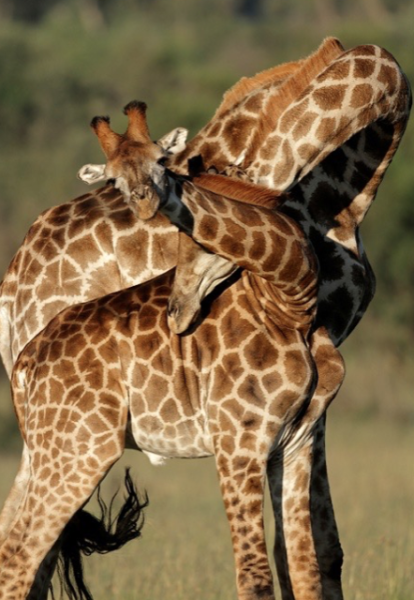 SAVE THE GIRAFFES exists to stop the sharp decline in numbers and preserve these wonderful creatures. A: To eat leaves from tall trees. Q: Do giraffes get sore throats? A sore throat can be caused by irritation, such as inhaling smoke, or by a virus, like the common cold, or by a bacterial infection, like strep throat. The key characteristic of a sore throat is pain, and we can’t ask giraffes if they have pain in their throats. When we get a sore throat from an irritation, it usually is not very severe and removing the cause, like leaving a room with smoke, reduces the pain. Giraffes might sometimes have sore throats from irritants in the air, but it’s unlikely that it is a big problem. A sore throat due to a virus is often accompanied by fever, chills, watery eyes, and other symptoms. The virus causing the common cold among people has cousins that infect horses, dogs, and cats, so there might be a giraffe flu, but we don’t know. We don’t see giraffes with runny noses. Plus their body temperature can vary quite a lot during the day, so a ‘fever’ to us is normal to them. They can raise and lower their body temperature to adjust to heat load. Strep throat is quite serious among people, sometimes resulting in rheumatic fever, and caused by the streptococcal bacteria, which is a very large family of infectious diseases. As with viruses, the bacteria causing strep throat has a number of cousins, so horses, dogs, and cats can also be infected with streptococcal bacteria. If your pet dog becomes lethargic, loses its appetite, coughs a bit, and vomits, it might have a streptococcal infection, so it’s time to visit the vet. Given that a host of animals can be infected by viruses and bacteria that are very similar to the ones that infect people, odds are that giraffe can also be infected by some of these same kinds of micro-organisms. So chances are that some giraffes do sometimes get upper respiratory tract inflammations causing a ‘sore’ throat. Q: How long is a giraffe pregnancy?